D.M. Bers, C.W. Patton, and R. Nuccitelli, A Practical Guide to the Preparation of Ca2+ Buffers. 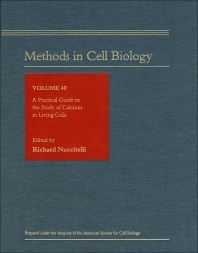 R. Zucker, Photorelease Techniques for Raising or Lowering Intracellular Ca2+. D. Thomas and M.R. Hanley, Pharmacological Tools for Perturbing Intracellular Calcium Storage. S. Baudet, L. Hove-Madsen, and D.M. Bers, How to Make and to Use Calcium-Specific Mini- and Microelectrodes. P.J.S. Smith, R.H. Sanger, and L.F. Jaffe, The Vibrating Ca2+ Electrode: A New Technique for Detecting Plasma Membrane Regions of Ca2+ Influx and Efflux. C.A. Leech and G.G. Holz, IV, Application of Patch Clamp Methods to the Study of Calcium Currents and Calcium Channels. J.P.Y. Kao, Practical Aspects of Measuring [Ca2+] with Fluorescent Indicators. S.J. Morris, T.B. Wiegmann, L.W. Welling, and B.M. Chronwall, Rapid Simultaneous Estimation of Intracellular Calcium and pH. T.J. Keating and R.J. Cork, Improved Spatial Resolution in Ratio Images Using Computational Confocal Techniques. P.A. Diliberto, X.F. Wang, and B. Herman, Confocal Imaging of Ca2+ in Cells. S. Girard and D.E. Clapham, Simultaneous Near Ultraviolet and Visible Excitation Confocal Microscopy of Calcium Transients in Xenopus Oocytes. K.R. Robinson, T.J. Keating, and R. J. Cork, Inexpensive Techniques for Measuring [Ca2+]I Changes Using a Photomultiplier Tube. A.L. Miller, E. Karplus, and L.F. Jaffe, Imaging [Ca2+]I with Aequorin Using a Photon Imaging Detector. R. Rizzuto, M. Brini, and T. Pozzan, Targeting Recombinant Aequorin to Specific Intracellular Organelles. Index. A Practical Guide to the Study of Calcium in Living Cells describes popular techniques along with helpful do's and don't's and computer programs. The volume enables investigators to evaluate confocal images, use the latest dyes, and design Calcium buffers appropriate to their research needs. This book is designed for laboratory use by graduate students, technicians, and researchers in many disciplines, ranging from molecular to cellular levels of investigation. Division of Biological Sciences, University of California, Davis, U.S.A.